Bracket size indicates the size of the shelf that the bracket fits. 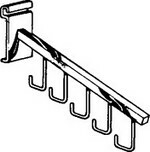 Actual bracket's overall length off the gridwall is 1/4" longer than size listed to accommodate the hook end. Holes in brackets to lock in the optional shelf clips. Screw shelf clips to wood shelves (screws not included) to hold them from side to side movement. 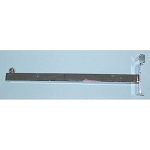 Shelf clips with bumpers for glass shelves keep the glass off the metal shelf and help with side to side movement.